Cut off the rind lengthwise in strips. With a paring knife or measuring spoon, pop out any of the little eyes or seeds that remain. 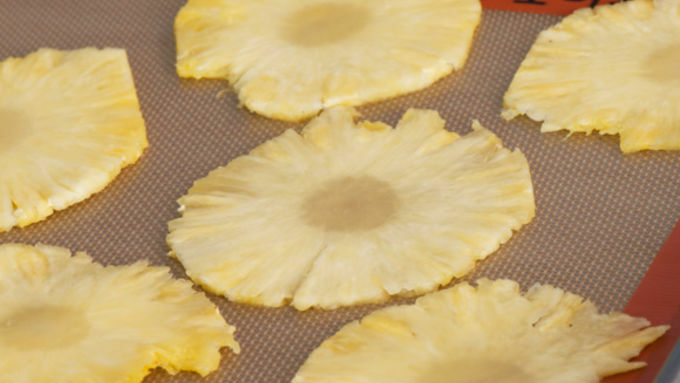 Don't worry about dinging the pineapple, the indentations will give your flowers lacy edges. 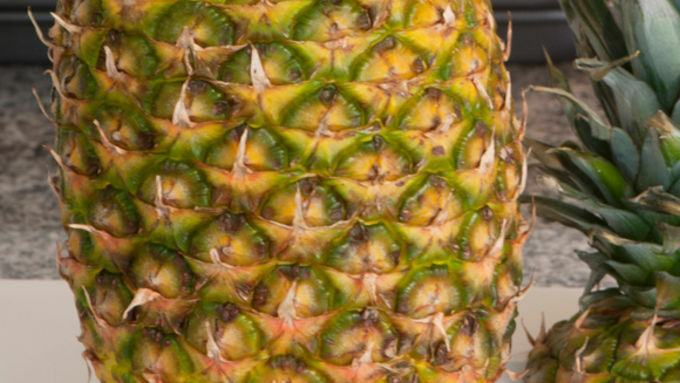 Slice the pineapple very thinly - the slices should be almost translucent. Pat them dry with a paper towel. 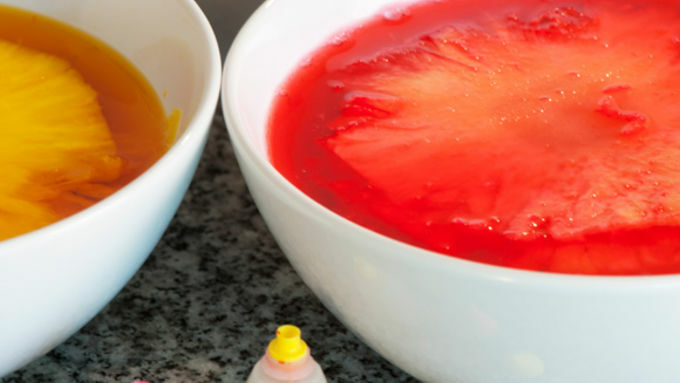 If you're tinting the slices, you'll need about 15 drops of food color to a cup of water for each color. In addition to the plain (which come out a light yellow color) I did a deeper yellow, a pink, and an orange. Allow to soak for an hour. I let my colored slices soak while the plain slices were in the oven. Lay the slices out on baking sheets lined with a silicone baking mat or parchment paper. Bake at 225° F for about 30 minutes. Remove from the oven and flip the slices over and pop them back in the oven for another 30 minutes. You'll probably have to do this several times - timing will vary, depending on the thickness of the slices, but this is a good starting point. 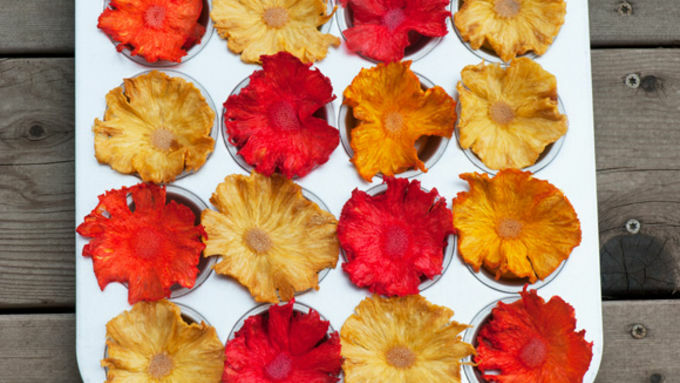 Once the slices are shrunken and almost completed dried out, transfer them to paper cups (or muffin tins if you have enough) so that the edges curve upward in the shape of a flower. Let the flowers sit overnight in order to retain their curvy petaled shape. Mother’s Day is approaching, and for once I have a plan! (Hurray for me!) I am so excited that my mom will actually be visiting for Mother’s Day this year. I’m planning a nice brunch, featuring pineapple mimosas and, for dessert, a cake with pretty dried Pineapple Flowers. (The other brunch offerings, are still filed under “Toss Up”, but hopefully sis has something up her sleeve ...) For delicious pineapple mimosas you can create a premade punch mix. I like to mix juices, and serve in a pretty pitcher alongside a variety of champagne, prosecco, sparkling water or juice. To serve, just dole out a bit of the mix, pop a few frozen strawberries in the glass, and top with your bubble of choice. I love a fresh bubble …. If you’re brunching on the patio, the frozen strawberries are key – they keep a mimosa cold without diluting. And they’re pretty! 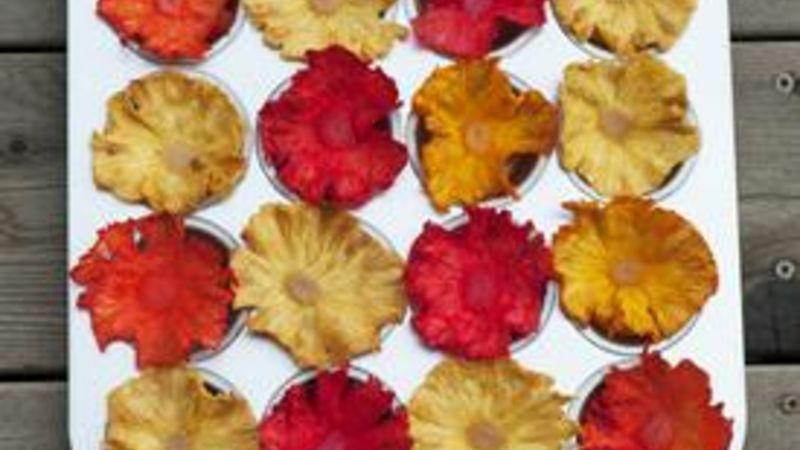 And don't forget to decorate the beverage table with pineapple flowers for an extra punch of color and fun! I’ve been dying to make the pineapple flowers for some time, after first seeing them in a Martha Stewart publication. The key, I learned, is slicing the pineapple very thin. If you have a mandoline slicer, this is the time to use it. I, however, do not have a mandolin. And as such, my slices were probably thicker than they should be. 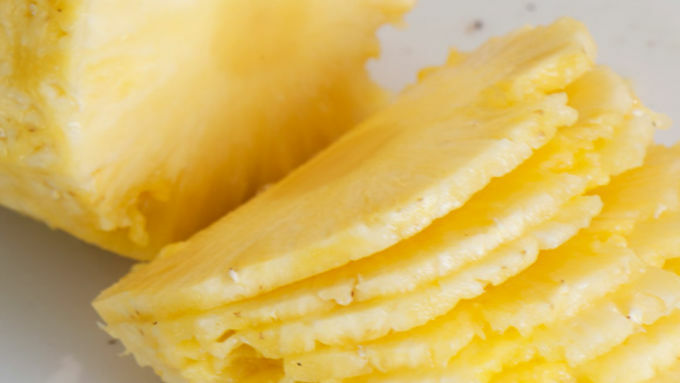 But not to worry – the technique still works with a more-than-paper-thin bit of pineapple – it’s just a bit more time flipping the slices around in the oven. The end result is a couple dozen (maybe more if you do a good job slicing) pretty flowers. I set a few of flowers on a cake, and scattered the rest across the table for a pretty, casual, spring-ish effect. Enjoy! And Happy Mother’s Day! 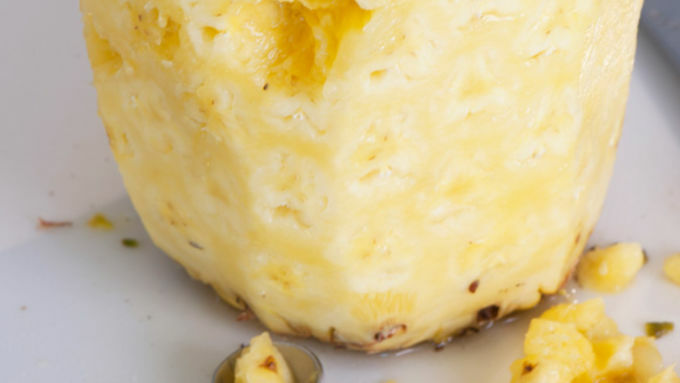 We've got plenty of pineapple recipes where that came from for all your brunches, barbecues, and tropical-flavored fun!